Ready to grow some delicious cucumbers? This veggie is one that doesn’t require much maintenance, so it’s ideal for beginning gardeners. Below, you will find seven tips for growing cucumbers that will help you on your way to a bumper crop that your family can enjoy throughout the summer! 1. Decide which type of cucumber plant is best for your needs. When it comes to growing cucumbers, you have two options. Bush varieties grow more compactly, and don’t require as much room. If you have a small garden or want to use containers, this is the type of cucumber plant for you. The second option is vining cucumbers. These selections need a trellis to wind around as they grow. The yields from vining plants tend to be straighter, and there is also less concern for disease and pests since these varieties have more room to grow. 2. Know what type of cucumber you wish to grow. There are some varieties that will produce a larger fruit that is perfect for slicing. If you want to have cucumbers for your sandwiches or salads, these are for you. Other kinds return smaller cucumbers that are perfect for pickling. 3. Use a dark-colored mulch for your cucumber plants. Cucumbers need warm, moist soil in order to thrive. Black or brown mulch will help the ground maintain a high temperature as well as moisture after a watering. The mulch will also help alleviate problems with weeds. 4. Give your cucumbers plenty of sunlight. In order to keep the soil warm enough for your cucumbers, make sure you plant them in an area that receives maximum sunshine. Even the least little bit of shade is not good for this vegetable. 5. Plant your cucumbers in rows. The best way to plant the seeds for your cucumbers is in rows, keeping them six inches apart. Place the seeds one inch into the soil. If you want an earlier harvest, you can begin growing seedlings indoors a month before you plan to plant the cucumbers in your garden. 6. Use row covers to alleviate pest problems. The most common pest for cucumbers is the cucumber beetle. They are highly destructive and can cause your plants to wilt quickly. To combat these bugs, cover your seeds with a lightweight row cover until they start to flower. Then, switch to natural pesticides to keep the insects at bay. 7. Harvest your cucumbers often. 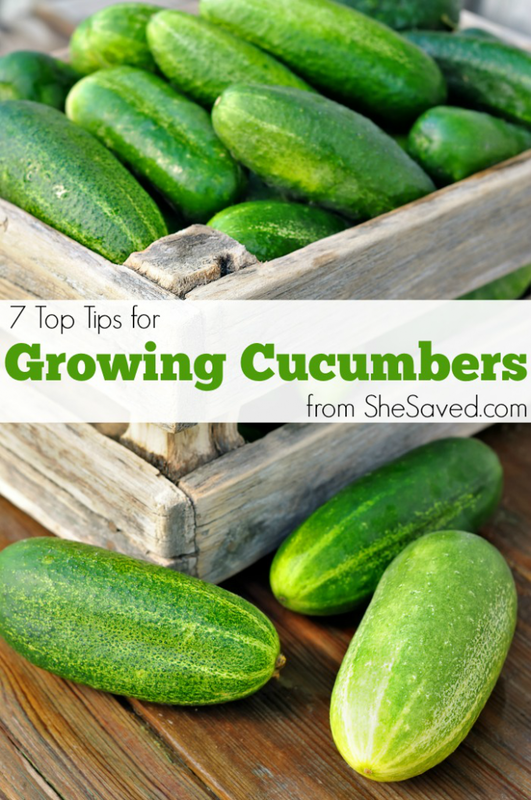 Once they start reaching the size you need, you will want to pick cucumbers every other day. The more you pick, the more the vines or bushes will keep producing. Avoid letting the cukes get too large or they will have a bitter taste! I have shared quite a few of our gardening tips recently and if you are getting into gardening then my might enjoy my article 10 Vegetable to Plant in May along with my Top Tips for Growing Carrots and my Top Tips for Growing Asparagus. And, if you grow berries, then make sure to check out my secret for Keeping the Birds Out of Your Berry Patch, these tips literally saved our berry garden!